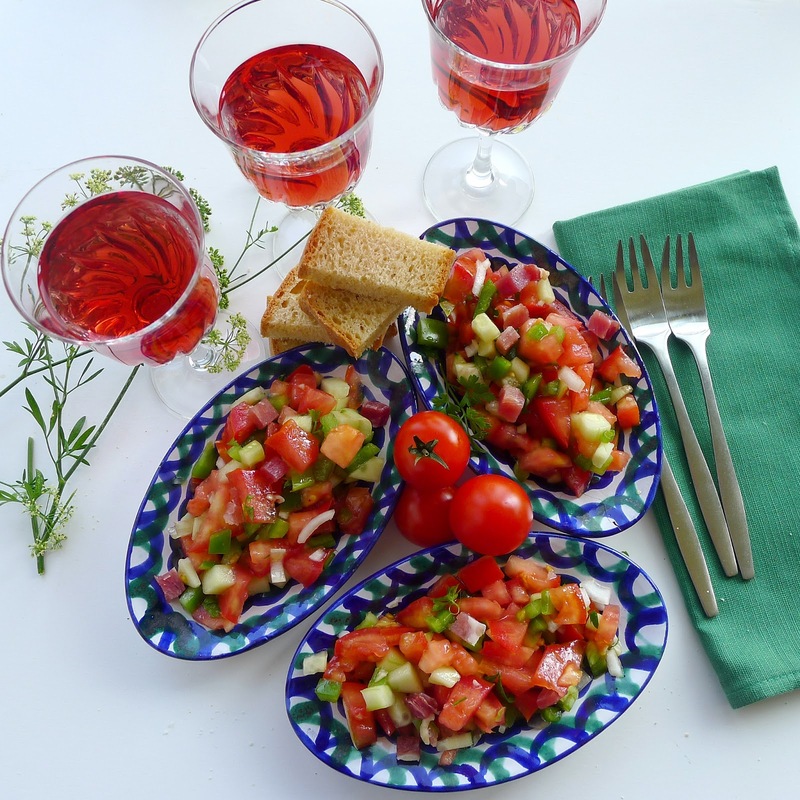 Pipirrana is a summertime al fresco salad. What a gorgeous early summer we’re having here in southern Spain. Temperatures are below average and a fresh breeze (a levante, east wind) is blowing. Cooler weather means the garden is slow to produce. Tomatoes and peppers are still weeks away. Meanwhile, I have pots of cherry tomatoes and freshly dug onions and garlic. Local markets have early crops of tomatoes, peppers and cukes. 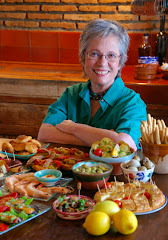 They entice me to make some of Spain’s great al fresco salads. This one, pipirrana, in Andalusia is a favorite at tapa bars. 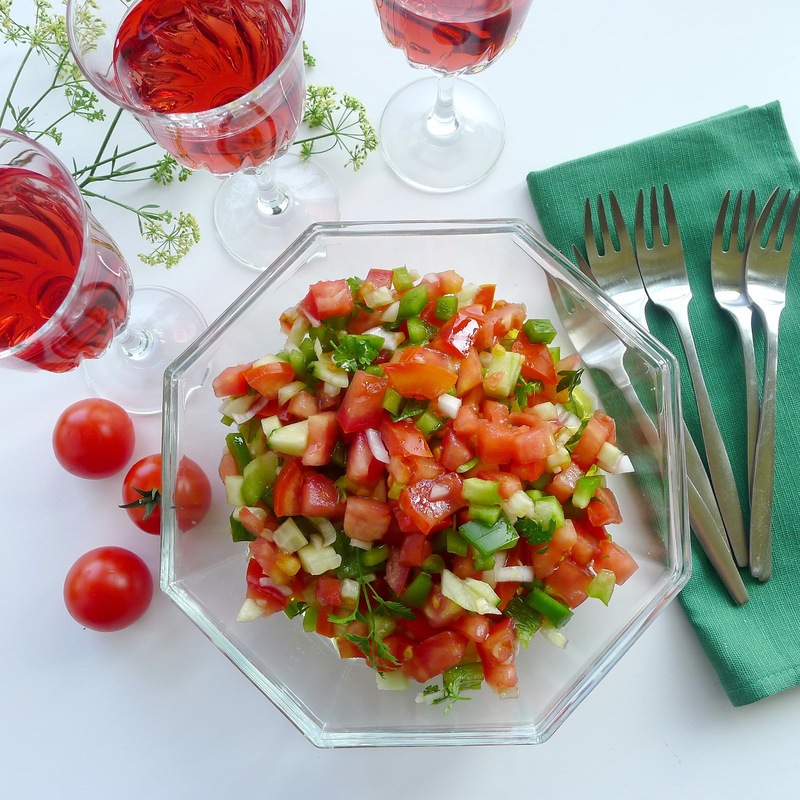 It’s basically a chopped salad of tomatoes, green peppers, spring onions and cucumber. 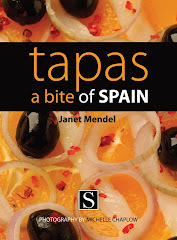 As a tapa it may be garnished with canned tuna, chopped serrano ham or hard-cooked egg. 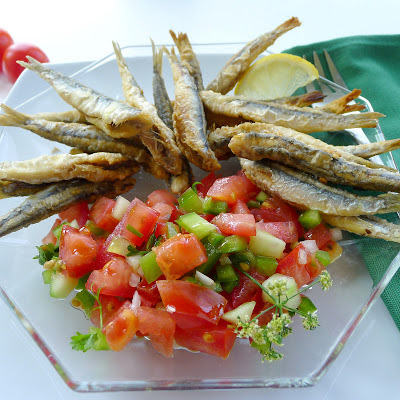 Without the garnishes, it makes a fresh side dish with fried fish or with foods from the grill (add pipirrana to your 4th of July menu). And, with water added, the pipirrana, accompanied by bread for sopping, makes a simple sort of gazpacho. A salad served in tapa bars. I’ve enjoyed the identical salad in Morocco, just across the Straits of Gibraltar from Spain, as an accompaniment to street food such as brochettes. There it is made with cilantro (coriander leaves) instead of parsley and with just a hint of chile. With the addition of shrimp, mussels, octopus or fish roe (huevas), basic pipirrana salad is transformed into salpicón de mariscos, a fresh seafood cocktail, widely served in tapa bars (that recipe is here). Piparrana is the perfect accompaniment to fried fish. These are boquerones, fresh anchovies. Chop all the vegetables in small dice. The salad is best made shortly before serving. Leftovers can be refrigerated. 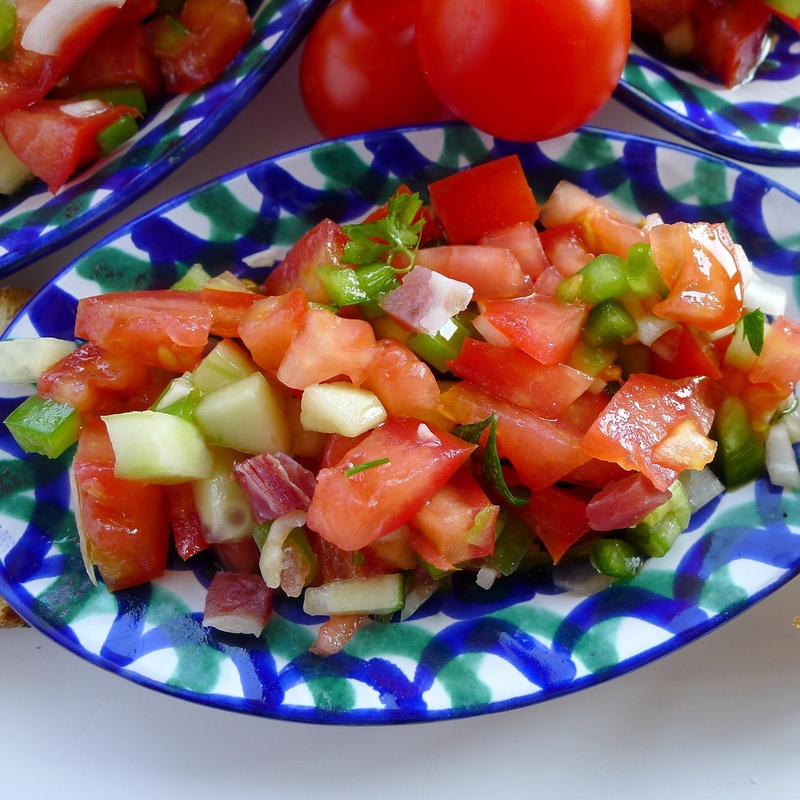 Combine the chopped tomatoes, onions, peppers, cucumber and garlic in a bowl. Sprinkle with the salt, parsley and cumin. Drizzle with the vinegar and oil and toss the salad gently. Arrange it on a platter. Garnish the top with chunks of tuna and chopped egg, if using. Rosado--the perfect al fresco wine. 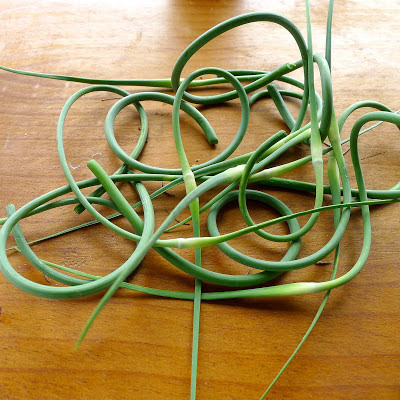 A tangle of garlic scapes. Before the garlic come the scapes. 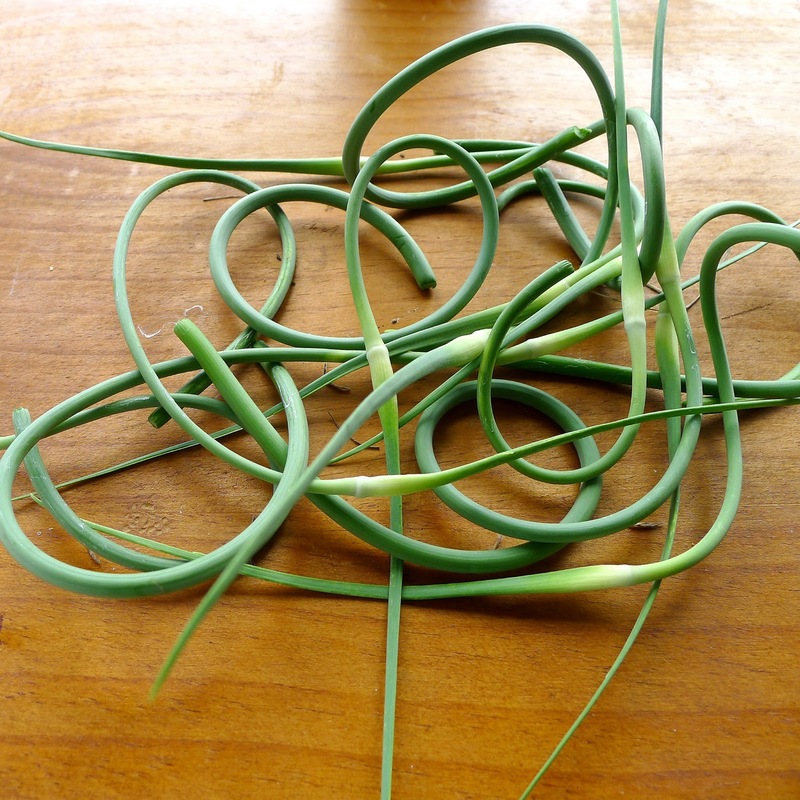 Coiled, tangled and twisted, scapes are the flowering stems of garlic plants. I am growing the esteemed ajo morado, purple garlic, a hardneck variety. 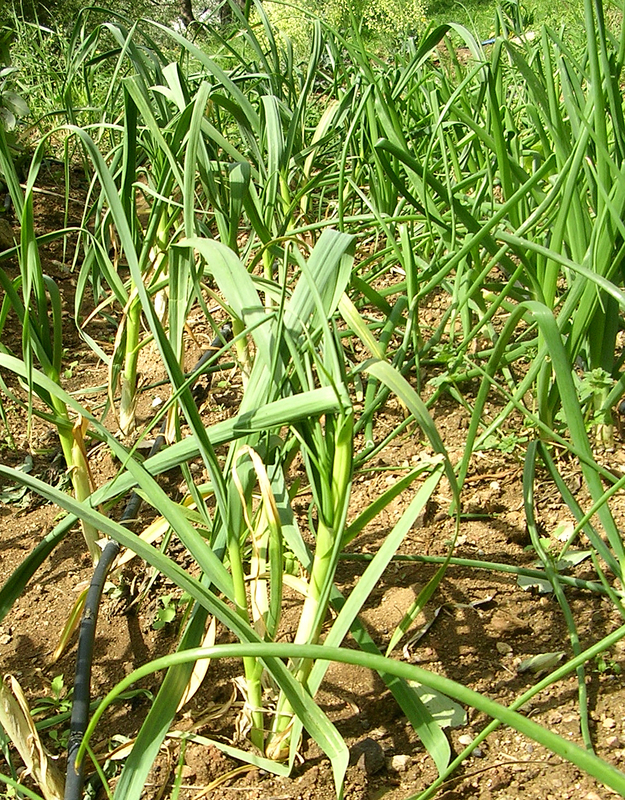 We planted out cloves of garlic last December. Green garlic shoots, ajetes, appeared in April. I pulled up a few, thinning the patch, and used them in revuelto, eggs scrambled with green garlic shoots, mushrooms and shrimp (recipe). A field of green garlic. Ajetes are green garlic shoots with baby bulbs forming. Now the garlic plants are sending up palotes, scapes. We cut them back, encouraging the bulbs to grow larger. 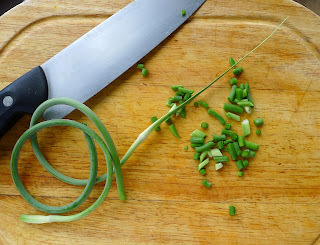 These pungently-flavored stems, if cut when young and tender, can be used raw, like scallions. The tougher ones can be chopped and sauteed, punching up the flavor of stir-fries, soups, sauces. 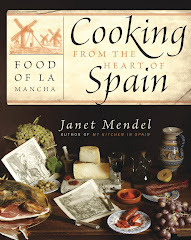 Here’s a recipe from La Mancha (the garlic-growing capital of Spain) for potatoes mashed with garlic scapes. Look for scapes at farmers’ markets. They are, fleetingly, in season right now. 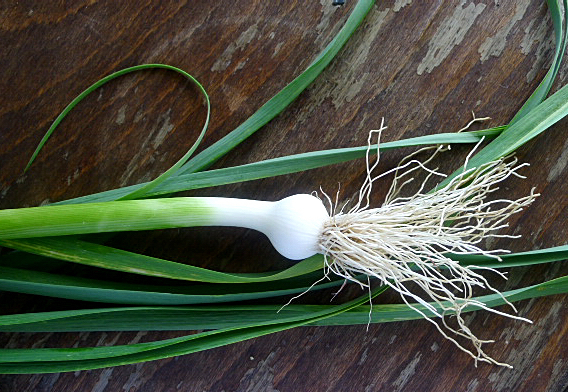 If not available, substitute scallions plus additional cloves of chopped garlic. 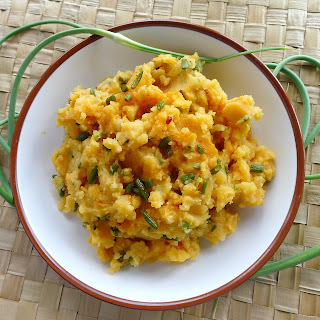 Chopped green garlic scapes flavor mashed potatoes. Peel the potatoes, cut them into pieces and cook them in boiling, salted water until very tender. Drain the potatoes, saving 1 cup of the liquid. Heat the oil in a heavy skillet and gently sauté the chopped garlic shoots and garlic for 5 minutes. Remove the pan from the heat and stir in the pimentón and red pepper flakes. Return the skillet to the heat and add the drained potatoes. Chop and mash them in the oil until almost pureed. Stir in ½ cup of the reserved potato water, the salt and pepper. Keep stirring and mashing the potatoes, adding up to ½ cup additional liquid to make a mixture the consistency of mashed potatoes. It’s ok if potatoes have a few lumps. 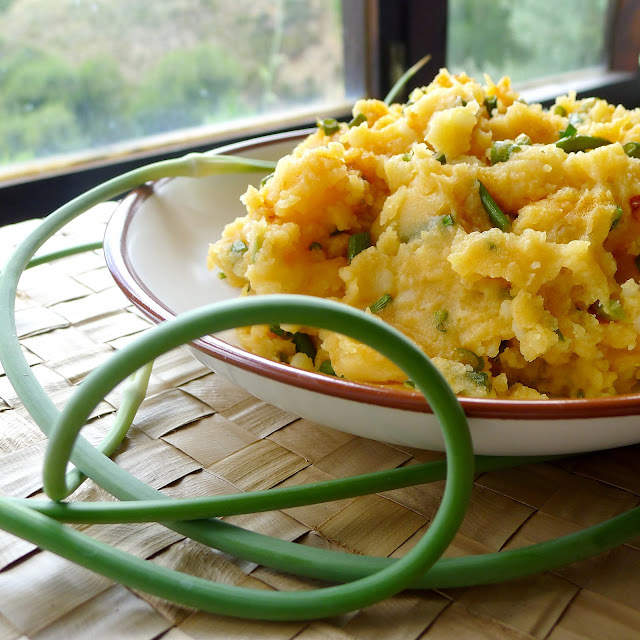 Great side dish--garlicky mashed potatoes. 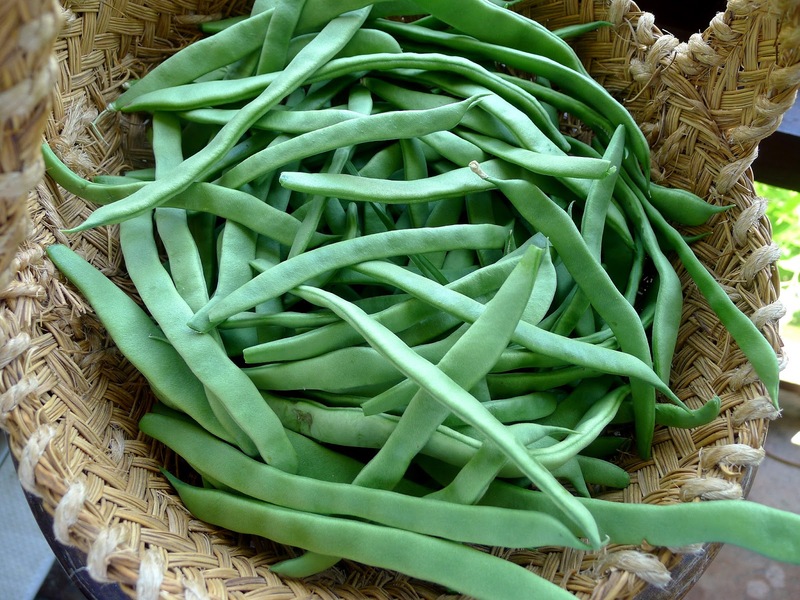 Just picked--a basket of beans. I wrote about green beans on one of my first ever blog posts (recipe here). Then, I was picking the last of the late-summer crop. Now I’m picking the first of the spring planting. Welcome back, beans! 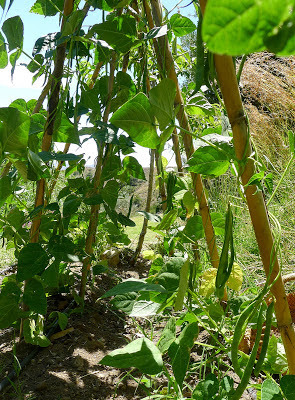 Beans climb up caña poles. I’m wild about beans. I cook up a mess of beans and store them, refrigerated, ready to add to different dishes. 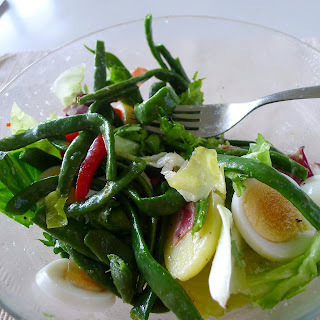 I heap beans onto mixed salad with tuna or sliced chicken for a satisfying lunch. I serve them, reheated, as a vegetable side, with only a drizzle of extra virgin olive oil. Beans go into potato salad with tangy lemon dressing (or, as in Ferran Adrià’s book, The Family Meal, with Chantilly-mayonnaise foam). I add green beans to stir-fries and to curries. I like beans with a sprinkling of toasted almonds, with bacon bits or with walnut pesto sauce. In Spain, rarely do you find green beans served as a “plain” side dish alongside a meat or chicken main. Beans (known as judías verdes, habichuelas or alubias), as with other vegetables, are more likely to turn up as a starter, in place of a salad or soup, or as an ingredient in the salad or soup. 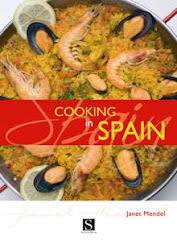 Or, in paella. Flat green beans go into authentic Valencian paella. 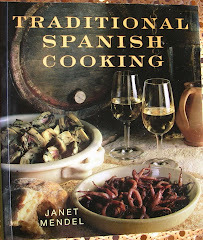 Nor is “crisp-tender” part of the lexicon of Spanish home cooking. Beans are more likely to be cooked until quite limp. Slow-cooking is a fine technique for mature beans that can be quite fibrous. Timing? It sort of depends on the beans—small and freshly picked or leggy and mature—and the quantity. For crisp-tender, I cook a pound of beans, topped and tailed, in two quarts of boiling salted water for 4 to 5 minutes (timed from when water returns to a boil). After draining, I plunge beans in ice water to stop the cooking. Both of the following recipes include vinegar—a tangy complement to beans. Add the vinegar dressing or sauce to the beans shortly before serving, as vinegar tends to turn the beans from a lively green to a dull color. 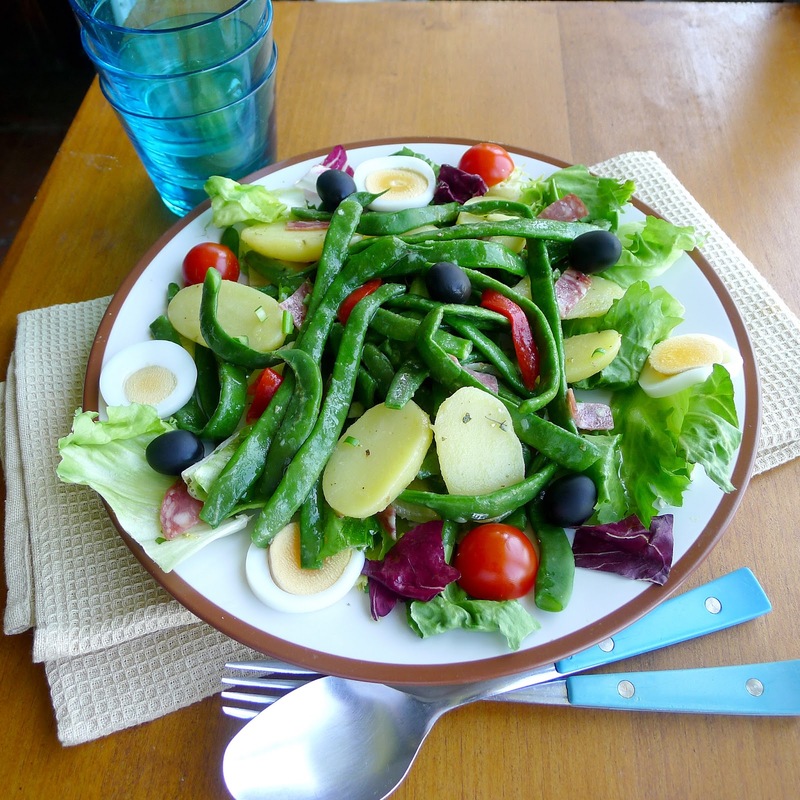 A jumbled salad of beans, potatoes, greens and peppers. You might add slivered salchichón (similar to salami) or minced anchovies to this salad. Flame-roasted bell pepper is best for this recipe, but, if not available, used canned pimiento. Top and tail the beans, but leave them whole. Cook in boiling, salted water to desired degree of doneness (crisp-tender or well done). Drain and refresh under cold water. Cook the potatoes in boiling water until tender. Drain. Peel and cut the potatoes in lengthwise wedges. Combine the beans and potatoes in a bowl. Add the garlic, onion, diced pepper, oregano, red pepper flakes, oil, vinegar and salt and pepper. Combine gently. If desired, let the ingredients marinate at room temperature for 1 hour. The beans will lose their bright green color but absorb more of the flavoring of the dressing. Place lettuce leaves on a serving platter. Arrange the beans and potatoes on top of the lettuce. Spoon over all the remaining dressing. Garnish with sliced eggs and a few olives. Beans and peppers with a garlicky sauce--a great vegetarian main dish. 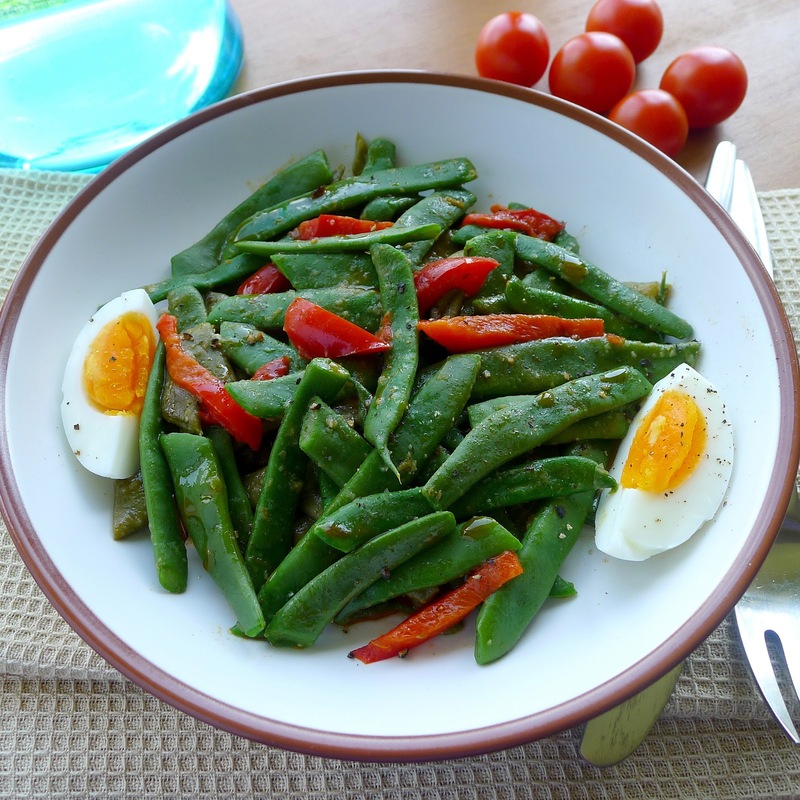 Turn this into a vegetarian main dish by adding eggs—hard-boiled or poached—to the beans. 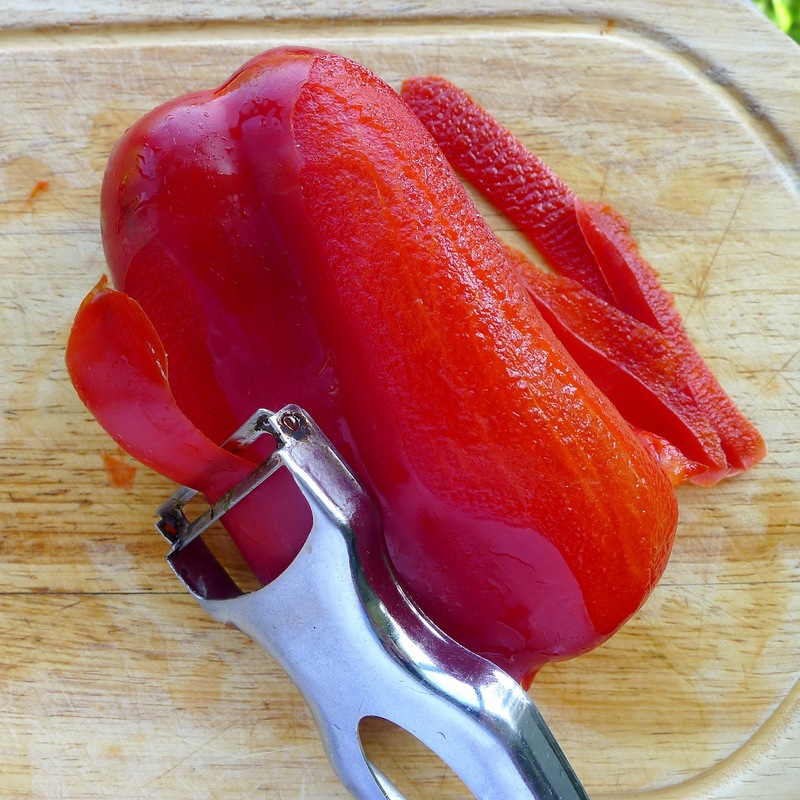 Use a vegetable peeler to remove some of the skin from the red bell pepper before cutting into slivers. Cut the beans into 2-inch lengths. Cook in boiling salted water until crisp-tender (about 4 minutes). Drain, saving ½ cup of the liquid. Refresh the beans in cold water. Sprinkle the bread with the vinegar and let it stand until softened. Place the bread, garlic, pimentón and ¼ cup of reserved bean liquid in a blender and blend until smooth. Heat the oil in a skillet and sauté the beans with the slivered red pepper for 5 minutes. Add the garlic paste and the remaining ¼ cup of bean liquid. Cook 3 minutes more. 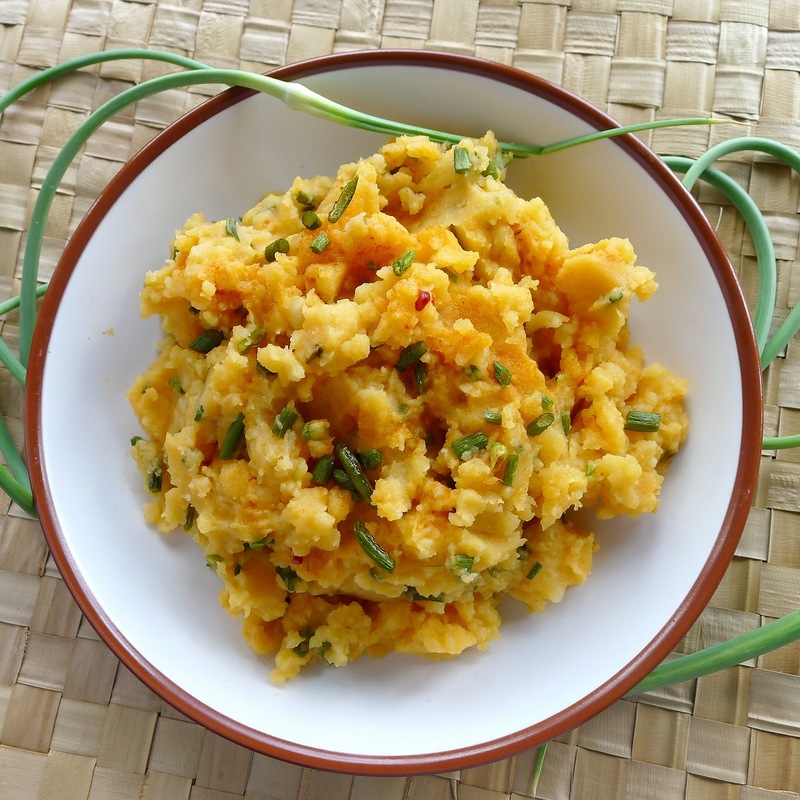 Serve with eggs, if desired. Serve hot or room temperature. Here's my lunch after I took the photos--I dumped the bean and potato salad with peppers and strips of salchichón into a bowl. Delicious. I could eat beans at every meal. And, for a few weeks, I probably will! Flaky fresh hake and potatoes with Galician ajada sauce. It’s true, I LOVE hake, a steely-grey fish of the cod family. Maybe I’d even go so far as to say it’s my favorite fish. Until recently however, I rarely cooked hake, as my local fish market didn’t carry it. I’m a follower of the “love the fish you’re with” persuasion. Mackerel, fresh sardines and anchovies, farmed gilthead and sea bass, the extraordinary red mullet (salmonete), farmed Norwegian salmon (can’t love it, but eat it occasionally), monkfish, dogfish (cazón), and, guiltily, bluefin tuna are my usual companions, available locally. Fresh hake I would buy only when trawling in bigger markets on the coast. And, no, I won’t eat frozen fish. Hake (merluza in Spanish) is a good-sized fish—about 2 feet long and weighing around 4 pounds, market size, including the head. The best fish are de anzuelo or de pincho, hooked on a long line rather than captured in a net. Hake has lean, white flesh with a delicate flavor. It’s flaky and moist when perfectly cooked. Overcooked and the delicate flesh tends to disintegrate. Hake, like cod, is terrific battered and fried. But, to me, it seems a shame to disguise the flavor with frying. 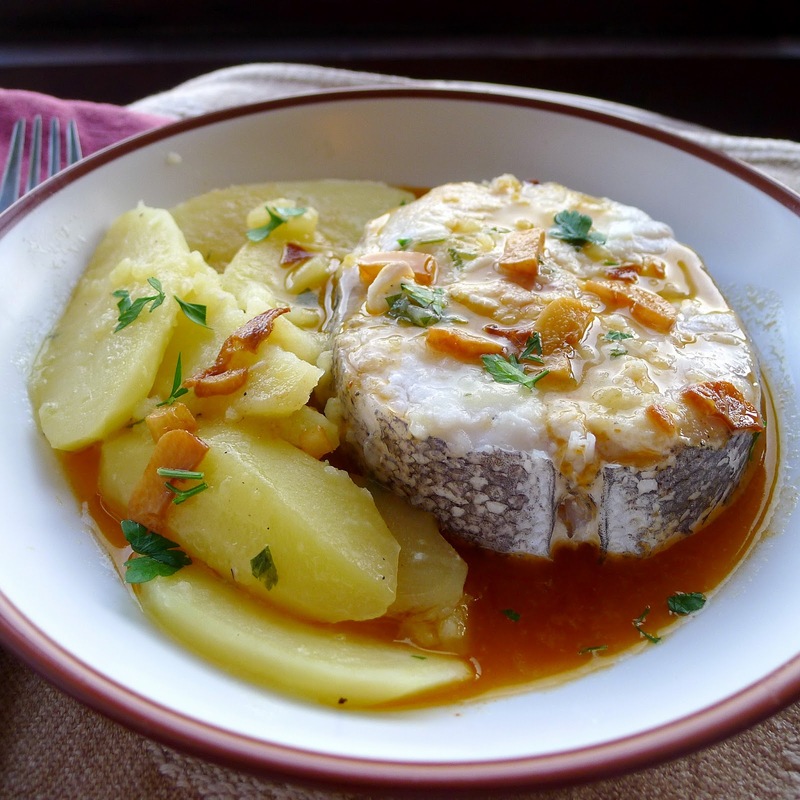 In Galicia (northwest Spain) hake is simply poached, usually with potatoes, then served with a garlicky ajada sauce. 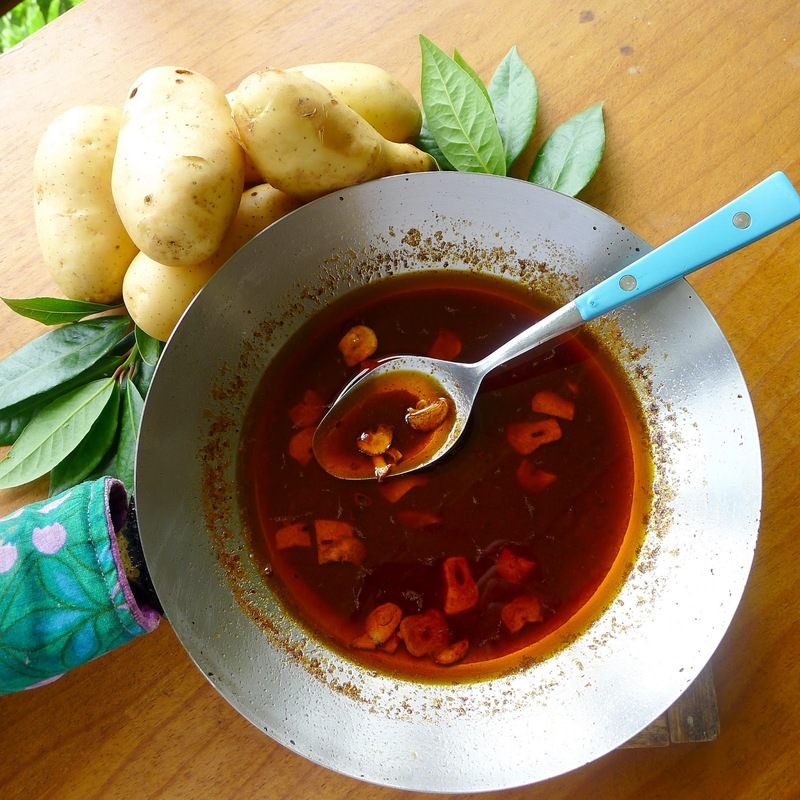 Ajada sauce with garlic and pimentón. 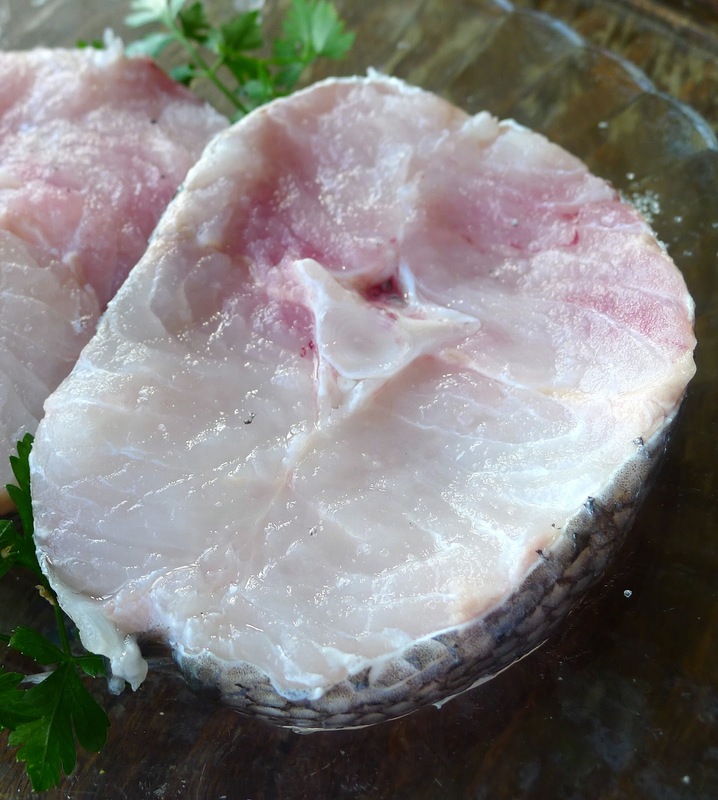 Use this recipe for other delicate fish such as turbot. Use regular sweet pimentón (paprika), rather than smoked pimentón, for this recipe. Add some pimentón picante—hot pimentón—to taste, or substitute a pinch of cayenne. Sprinkle the fish with salt and set aside for 30 minutes. Put 2 tablespoons oil in a cazuela with the potatoes, bay leaf, parsley, salt and pepper. Add water to almost cover the potatoes. Bring to a boil, then simmer until potatoes are tender, about 15 minutes. 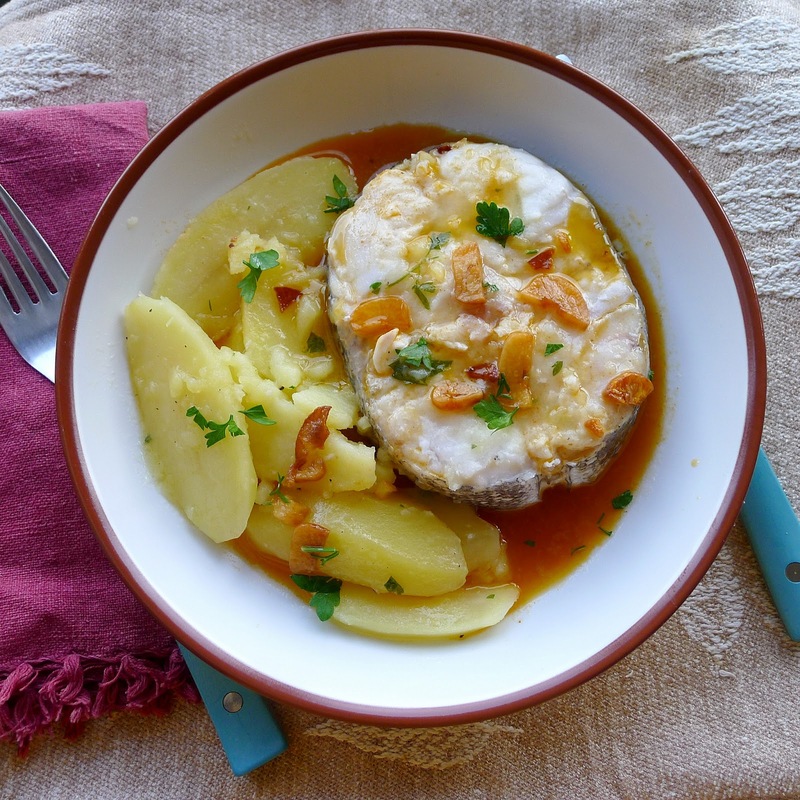 Place the hake steaks on top of the potatoes. Cover and cook 3 to 4 minutes. Remove the cazuela from the heat and allow to set 10 minutes. The fish will finish cooking during the resting period. Meanwhile, in a small skillet heat the 3 tablespoons of oil with the garlic. When garlic begins to turn golden, remove the pan from the heat. Stir in the two kinds of pimentón and vinegar. Add the potato liquid, stock or water. Season with salt. Return the skillet to the heat and cook, stirring, 2 minutes. Spoon the ajada sauce over the hake steaks and potatoes. Garlic and two kinds of pimentón make the simple sauce. The feria season in Spain has begun! 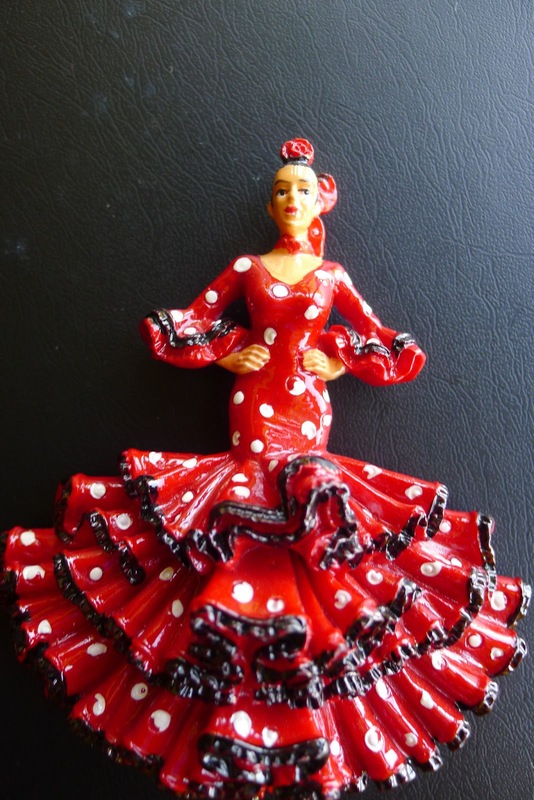 Starting with the April feria in Sevilla, on into May with the romería of Rocío, the horse fair of Jerez and, this week, the grand feria of Córdoba, it’s time to get out the traje de flamenca, flouncy flamenco dress, and brush up on your sevillanas and fandangos. Get the horses, if you’ve got them, groomed and ready for parading. 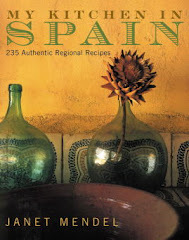 Believe me, feria in Andalusia has nothing to do with tourists. It’s the year’s biggest event for the locals. Flamenquines are fried pork rolls with ham and cheese. This week’s recipe has a bit of feria flounce, too. 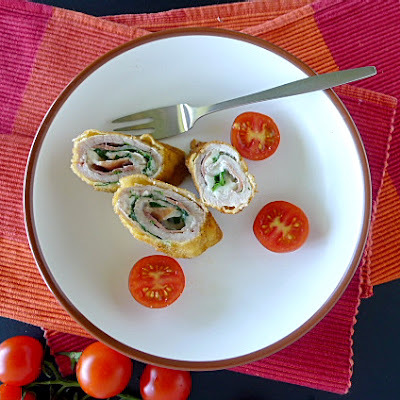 Flamenquines are crispy, fried pork rolls with a stuffing of ham and cheese. OK, I really don’t know why they are called flamenquín, which could mean “little gypsy,” or “little Flemish person” or “little flamingo.” But, probably not. Flamenquines, a tapa bar favorite, supposedly originated in Jaén or Córdoba. While it has many variations, the one I first tasted in Jaén remains my favorite—pork cutlets rolled around ham and cheese. The rolls are breaded and fried until crisp. I made an experimental roll with a few spinach leaves laid on top of the cheese slice. Very good. You could try also a strip of roasted red pepper or a cooked spear of asparagus in the filling. 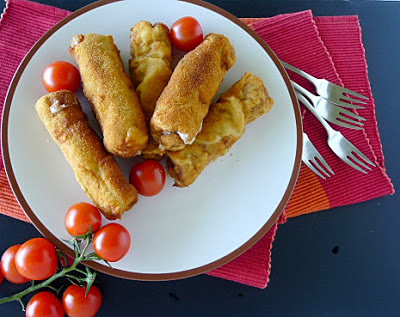 To fry the rolls, heat the olive oil until shimmering, but not smoking. Put a few rolls at a time into the skillet, turn them to seal on all sides. Then lower the heat to medium and fry on all sides until golden-brown. This way the pork cooks thoroughly in the time the crust browns. Serve the flamenquines with alioli (garlic mayonnaise), with a spicy tomato sauce, with chutney or simply with a wedge of lemon. Layer pork, ham and cheese. 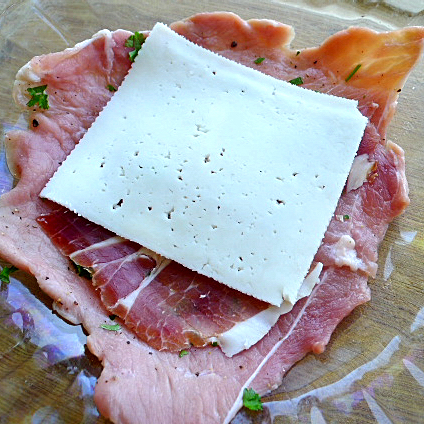 Place the cutlets between layers of plastic wrap and pound them to a thickness of ¼ inch. 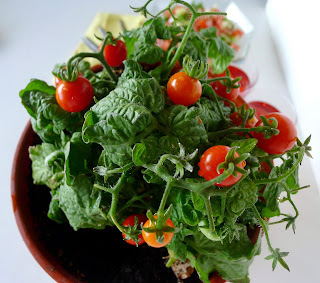 Sprinkle with salt, pepper, parsley and thyme, if using. Across each cutlet lay strips of ham and a slice of cheese. Starting with the wide edge, roll up the cutlets, jelly-roll style, tucking in the edges. If necessary, secure the rolls with toothpicks. Place the flour, beaten egg and breadcrumbs in 3 shallow bowls. Dredge the rolls first in the flour, patting off excess. Then put them in the dish of beaten egg, coating them well. Let excess egg drip off, then roll them in the bread crumbs, taking special care to seal the ends with egg and crumbs. Let the rolls dry for at least 30 minutes. The rolls can be prepared in advance and refrigerated, but bring them to room temperature before cooking. Heat oil in a skillet to a depth of ½ inch. Fry the rolls, a few at a time, until they are browned and crisp on all sides, about 4 minutes total. The meat should be cooked through and the cheese melted. Drain briefly on paper toweling and serve hot. These rolls have spinach leaves too.